St. Louis's newest Hampton product Beautiful 99 room property located at Lambert International Airport. All rooms feature the very best Hampton has to offer, including upgraded bedding, linen and terry. Every room offers microwave, refrigerator and complimentary high speed internet access. Enjoy our beautiful complimentary ''On the House'' Breakfast and surf the internet using our wireless lobby internet access. 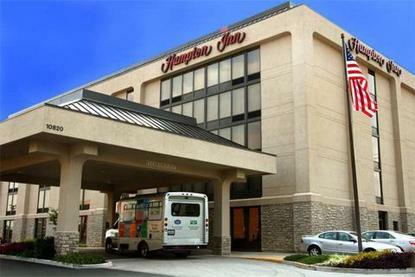 The Hampton Inn St. Louis Airport, situated off I-70 (Airport Exit 236), is one of the closest hotels to Lambert International Airport. The airport is the stopping place for Metrolink, a light rail system that travels to downtown areas of interest. Area attractions include Northwest Plaza Shopping Center and UMB Amphitheatre. Missouri Botanical Gardens and Forest Park (the St. Louis Zoo,Science Center, Art Museum) are 15 miles south east of the hotel. Within 3 miles you can dine at Bandana's, Rockriver Grill, Lombardo's, Casa Galardo,Applebee's or Red Lobster.